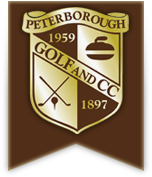 All of the contents of this website are copyright by the Peterborough Golf and Country Club. This website or any of the information it contains may not be copied, translated or distributed in any manner without the prior written consent of the Peterborough Golf and Country Club or its originating artists. For further information, contact the Club Manager. The Peterborough Golf and Country Club makes no representations or warranties with respect to this website or its contents. Peterborough Golf and Country Club is not liable for any losses or injury arising from inaccurate information. The Peterborough Golf and Country Club does not collect any personal information about users, except that which has been knowingly and specifically supplied to the Club by its members and guests. We will not disclose any personal information about users to an outside party, unless the user has been advised of this possibility before providing the personal information. We may share information with groups such as other golf clubs and golf associations. We reserve the right to access and disclose individually identifiable information in order to comply with applicable laws and lawful government requests, and to operate our systems properly or to protect our rights and property. Personal data in the website may be given to other golf clubs for tournament handicap purposes only. We may change this policy from time to time by updating this posting. Your continued use of this site following the posting of changes constitutes your acceptance of these terms.